Taylor Jungmann yielded no homers and two runs over seven innings while striking out eight in his only start against San Diego, an 8-5 win Aug. 5. Beginning with his major league debut in June, Taylor Jungmann was one of the NL’s top rookie starters for his first three-plus months. 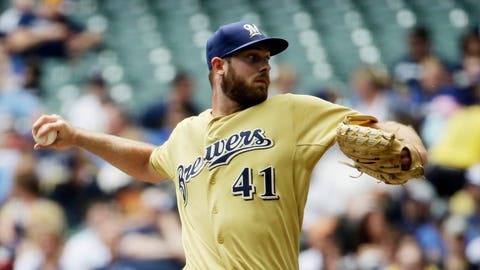 The Milwaukee Brewers right-hander has hardly looked like the same pitcher in recent outings but will get the chance to end his season on a positive note Thursday against the short-handed San Diego Padres. Jungmann went 9-5 with a 2.42 ERA in his first 16 starts after being called up June 9 but has gone 0-2 with a 9.61 ERA in his last four. He was charged with six runs in five innings in a 7-3 loss in St. Louis last Thursday. Jungmann (9-7, 3.64 ERA) gave up two homers and has allowed seven over 19 2/3 innings in the last four after giving up three in his previous 16 games. "Anytime I’m giving up home runs, it tells me one thing: I’m not getting the ball down," he told MLB’s official website. "It’s a long season. Everybody has little nicks and things like that. Stuff like that’s not going to hold you out of the game. I feel fine. My arm feels good. I’ve just got to keep working." Jungmann yielded no homers and two runs over seven innings while striking out eight in his only start against San Diego, an 8-5 win Aug. 5. The Brewers (68-90) won their fifth consecutive game in the series, 5-0 on Wednesday, by scoring all of their runs in the sixth. The Padres (73-85) lost Justin Upton in the first inning when he hit his head on a padded wall in left field. Interim manager Pat Murphy said Upton, who has a team-leading 26 homers and 81 RBI, has a strained neck. "He was checked out and everything looks fine," Murphy said. "Nothing major. . . . I don’t know how sore he is going to be (Thursday)." San Diego lost Matt Kemp for the rest of the season before that game due to a partially torn tendon in his right middle finger. Kemp, who has 23 homers, got his 100th RBI in his final at-bat in Tuesday’s series opener. "It’s a step forward. I guess it’s always good to drive in 100 (runs), but I’d rather have 80 RBI and go to the playoffs," he said. "Hopefully, it’s a step forward going into next year and we can win more games." Ian Kennedy (8-15, 4.38) will seek to end his season by snapping a six-start winless stretch, his longest in two seasons. The right-hander, 0-4 with a 5.77 ERA in his last six, allowed four runs and a season-high 11 hits over five innings in San Diego’s 5-4 comeback win over San Francisco last Thursday. Kennedy, who has a career high for losses, is 0-2 with a 4.97 ERA in his last four starts against the Brewers and yielded four runs in seven innings in an 8-5 defeat in his lone matchup this season Aug. 5. Khris Davis, batting .345 with seven homers in his last 16 games, is 3 for 6 with two doubles lifetime against Kennedy.